Ernest Clarke Williamson signed for the Arsenal on 14 April 1919. 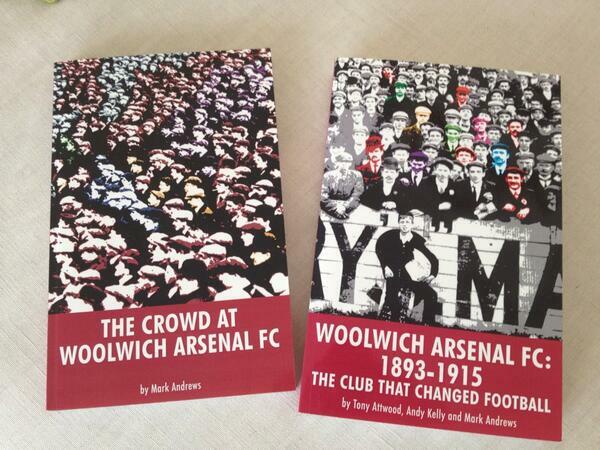 He moved to Arsenal from Croydon Common for £150 having played as a guest in 122 wartime matches for the Gunners. He made his competitive début in the first top flight game Arsenal played at Highbury, and over the next few seasons appeared 113 times for the Gunners. FOOTBALL – ASSOCIATION MATCH. 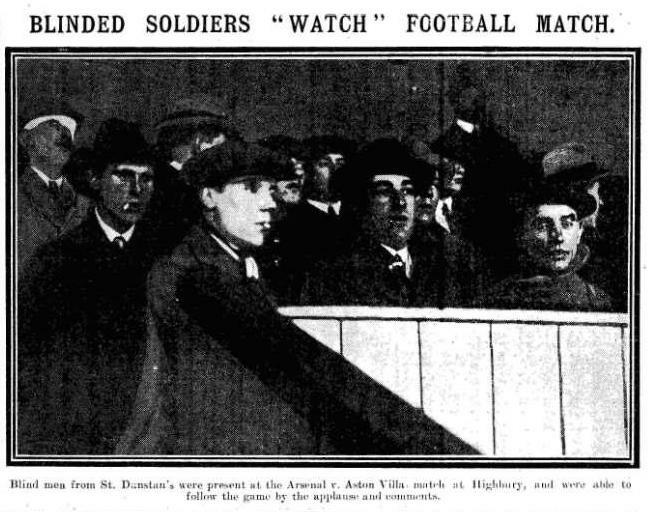 The Arsenal v Tottenham Hotspur (for St. Dunstan’s Hostel for Blinded Soldiers and Sailors), 3.30, at Highbury. Spurs and Arsenal draw in St. Dunstan’s Charity Match. The Arsenal and Tottenham Hotspur failed to score in the match at Highbury on Saturday in aid of St. Dunstan’s Hostel. About 5,000 spectators saw the game, which was interesting. The Arsenal should have, won, but they frittered away many chances of scoring, and Jacques, in the Tottenham goal, gave a fine display. Both sides gave trials to new players, Bombardier Rose, on the Arsenal left, showing to fine advantage. Naturally the ground was hard after the recent spell of dry weather and the ball played some tricks with the players, who took time to settle down. Quite early in the game the Arsenal came near to scoring, but Jacques saved. Minter twice got through for the Spurs, but was offside, each time. In the second half the Arsenal were again the aggressors, but easy openings were lost. Just before the end McKinnon hit the post, but that was the nearest either side came to scoring. All money raised in this game was to help out with the ex-servicemen, and from this point on Williamson began to help raise funds as well. This game was also the last Arsenal played in the wartime seasons, and before peacetime football started again. In the Great War Ernie Williamson himself had enlisted on 15 December 1914 during the first meeting of the Footballer’s Battalion but was discharged from that regiment owing to flat feet at the end of March 1915. He was moved to the Royal Army Service Corps (RASC) based at Deptford as a Sergeant Major, allowing him the chance to regularly guest for the Gunners and also for the RASC team. St Dunstan’s was set up in January 1915 to provide rehabilitation, training and lifelong help to the servicemen who came back from the war blinded. The founder was Sir Arthur Pearson who had recently gone blind due to Glaucoma. In all, just over 3,000 men and women were assisted. The men ‘learnt how to be blind’ in the St Dunstan’s Lodge at Regent’s Park, being taught Braille and other occupational skills to allow them to return to their families and support them. In 2012 the organisation was renamed the Blind Veterans UK. On 24 January 1920 Highbury entertained eight blind servicemen and four sighted ‘guides’ who were there to provide running commentary and assist their colleagues in the unknown environment. They came to witness the match against Aston Villa which was lost 0-1. Williamson did not play in this game as he had been replaced in goal by Stephen Dunn a week earlier. Arsenal regularly allowed ex-servicemen in for free in the first season after the war, which was a magnanimous decision bearing in mind the club were in dire financial straights. The football fans amongst the St Dunstan’s residents got real enjoyment from going to Arsenal, Chelsea or Fulham – as many other London clubs were involved in this service. A Jockeys’ football match at Highbury was kicked off by future Arsenal chairman Lord Lonsdale at 3:00pm on Monday afternoon of 10 May 1920. The match was arranged by the Jockeys of England and Ireland who felt the Jockey Club and racecourse owners were not doing enough for blinded soldiers and sailors. Owing to Arsenal’s burgeoning links to the Regent’s Park charity they were only too happy to help out by providing the location. The match was played for two deserving causes in St. Dunstan’s and the Drogheda Memorial Hospital. The Irish were one up at half time and won the game 2-0 in front of 30,000 spectators! A week or so previously Arsenal had ended the season at home in front of the exact same sized crowd, showing the popularity of the Jockeys and the causes they were playing for. A £50 trophy donated by Lord Decies was presented to the winners of the match. Both charities received in the region of £1,000, the £1,700 gate money bolstered among other things by the victorious Irish team auctioning off the trophyafter the game. There’s Donkeys on the Highbury pitch!!! 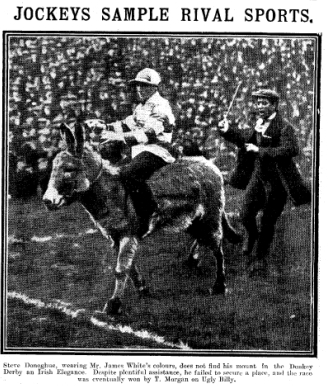 During the interval there was a Donkey Derby on the pitch involving flat riders of both countries. Starters orders was carried out by Lord H Vane Tempest. Lords Cholmondeley and Lonsdale were judges of the race which was won by Ireland’s Tommy Morgan on Ugly Billy. On 18 November 1920 Williamson kept goal for the inaugural Sir Arthur Pearson Challenge Cup, and in this first competition Bungalow Rovers beat North Rovers 7-3, in front of a “splendid muster of spectators” at Regent’s Park. 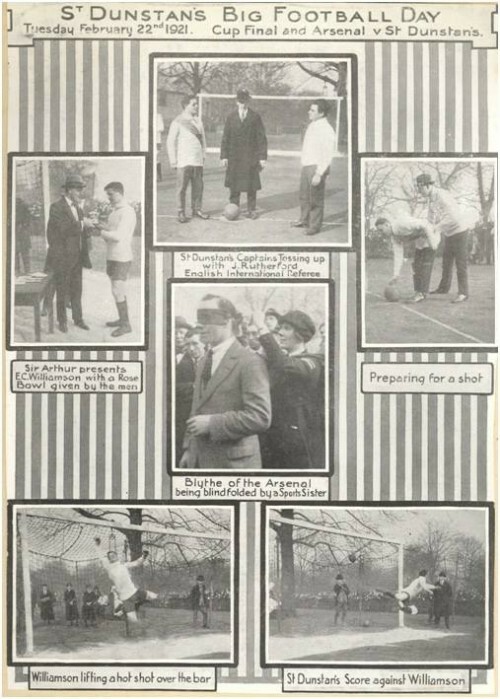 This was a regular competition between blind servicemen, usually in teams of six, played out as an effective series of knockout penalty shoot outs from fifteen yards. Each player had two shots each half. Williamson, as the sighted keeper, clapped his hands to indicate his position, so the penalty taker knew where to aim. Shortly afterwards on 14 December the full Arsenal team paid a visit. They played a similar penalty shoot out style of game blindfolded and the Gunners won 4-0. Williamson was in goal for both teams and Jock Rutherford was referee. So impressed were the Gunners that they clubbed together and offered gold medals for the winners and the runners-up of the next Arthur Pearson Challenge Cup, for which sixteen teams entered. On 22 February 1921 the full Arsenal team arrived at Regent’s Park together with manager Leslie Knighton and director William Hall for a full day of sporting events, which was watched by a huge crowd who lined the railings of the football ground. First up was the penalty shoot-out between Morgan Maroons and Park Rangers. The former team won 5-3 with the trusty pair of Williamson in goal and Rutherford as referee. After the final, The Arsenal were blindfolded and played an eleven against eleven shoot-out event which the Gunners ran out winners 5-3, but only after the match was drawn at 3-3 for a long time. At the conclusion Sir Arthur Pearson presented the gold medals to all the winners and the runners-up, but not before he had a try at beating Williamson from the spot. However his effort was easily saved as it was straight at the keeper. 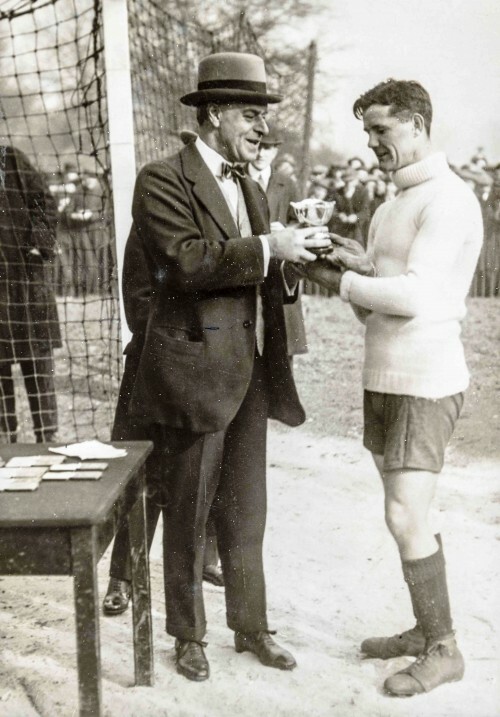 Additionally, and as a complete surprise to Williamson, the St Dunstan’s men bought him an inscribed silver rose bowl as a token of their appreciation of twice arranged for the whole Arsenal team to play blindfolded against the veterans as well as his goalkeeping in their competitions. After the game and prize presentation, the players toured the workshops to see what the servicemen were making. This visit by Arsenal was a large media event and both newspapers and the cinema recorded the event for the rest of the country to witness. I can assure you that our boys thoroughly enjoyed the day amongst the St Dunstaners, and as they have described it, properly had their eyes opened at the wonderful work of the institution. We are all so pleased to know that your boys are delighted at our little effort to bring a little happiness into their lives. Williamson continued supporting the Regents Park based charity until 1923 when he moved to Norwich; also writing an article extolling the skill of Charlie Buchan, who had himself visited the charity in 1921, for the St Dunstan’s review in April 1922. It is not recorded why he was so involved, though having enlisted into the Footballer’s Battalion in December 1914, he no doubt came into contact with the seemingly endless misery of the awful conflict. Williamson may well have been moved to assist after playing in the friendly against Spurs in May 1919. Later in his career he was picked for England twice in a tour of Sweden in 1923, just prior to his move to Norwich. Williamson was the first keeper to play for England while the club was at Highbury, and overall the second English international Gunners’ keeper after Jimmy Ashcroft. Williamson was the first in a very long line of top quality international Arsenal goalkeepers at Highbury: from Moss, Swindin, Kelsey, Wilson, Rimmer, Jennings, Seaman to Lehman.